Home security is designed to keep people and their homes safe and keep burglars out, just having CCTV installed at your home gives you peace of mind that your belongings and home are safe. Although home security systems are not widely used, in my opinion, all homes should have them as they are generally inexpensive and it’s worth it to keep your family and home safe. So why should you install home security? What benefits does it bring you and your family? Keep reading to find out! Who Can Install Home Security? You should never attempt to install any home security systems of CCTV cameras by yourself as you could do it incorrectly or even damage your security systems. One of our trained electricians in Milton Keynes would be happy to help fit your home safety device for you. Should home safety devices be a necessity? Members of the public are continuously moaning when break-ins or crime happen remotely around their home area (which is understandable) but why not put your mind at ease and invest in home security? People generally forget about these devices so not a significant amount of people have it installed and hardly anyone knows the many advantages that come along with having a home security device fitted! There are a number of different security devices that do a variety of different things for your home, here are a few. Unmonitored System – This system sets off a loud alarm both inside of the residence and outside when it is entered, the purpose of this is to alert your neighbours so that they can call the police if you are not home. Monitored System – The most favoured alarm system, this alarm alerts a call centre which will call the police shortly after being informed that someone has entered your home. Electric Current Home Alarm – Mainly used to monitor windows and doors, and if they’re opened the alarm will make a small beeping sound to alert you and your family. Wireless Alarm System – Uses individual sensors through the home that communicate wirelessly to the central control panel. 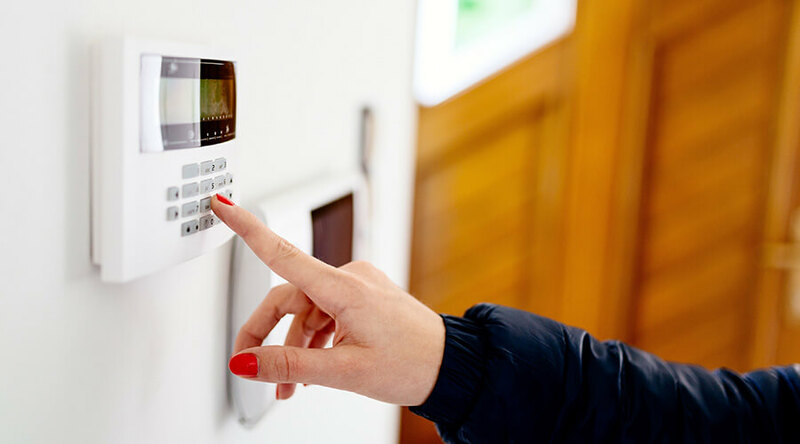 Now you know the different type of alarm systems, let’s talk about why you should install home security within your residence. This is probably one of the most obvious answers, but it’s true. Anyone who wants to do as much as they can to protect anyone or anything inside their home should install some form of home security. If it’s the middle of the night and your house alarm starts going off, you are going to be woken up, and you instantly know an intruder is in your home, not only this but it’s likely that the loud noise has scared the intruder away. As opposed to not having any home security, if someone was to break into your house in the middle of the night you may not necessarily hear them or be aware of their presence meaning that they have the freedom to do as they please in your residence. It’s also been shown that just the presence and visibility of a home security alarm in your home is enough to protect your home from burglars and puts them off from targeting your home. There have been cases where thieves have broken into a house unaware that the family are still home when he finds out the family are home this is more likely to scare the burglar and provoke him to be dangerous and aggressive. If you had a home security system by the time you were alerted that there was an intruder you would have enough time to get you and your family out of your home and to call the police. It is always a weight off your shoulders when you know you are in a safe environment, with elderly homeowners that are potentially disadvantaged or spend a vast time at home alone, having something such as a home security system fitted could give them peace of mind and make them more willing to stay home alone. Devices more suited for these sort of situations would be an alarm that alerts the authorities that can make their way straight to your home. Although you may already have smoke alarms, they can take a while to detect smoke unless it is in large quantities, home security systems include an early warning. Monitored home security systems will instantly alert residents of smoke and will also warn sources of heat and inform the authorities. Although smoke alarms are good for home fires, these home security systems offer the protection of your home from potential robberies and damage while also protecting it from tragedies such as house fires. Smoke alarms alert you of smoke, but they do not contact the authorities. I’m sure that throughout your life you’ve picked up some cool and valuable items along the way that you really would not want to be damaged. Some of these items can be trophies or medals that represent big accomplishments you’ve made in your life; they could be an item that was given to you by a now-deceased family member. Whatever it may be you would hate for anything to happen to these valuables. Despite these alarms being able to alert the authorities of a burglary or fire you can upgrade them a step further to ensure total safety to your home, by adding security cameras you can catch daring burglars red-handed in the act of trying to do the off with your prized possessions. With CCTV the police are more likely to be able to trace the perpetrator with video evidence, not to mention that the footage could help send them down in court for intruding into your home. With these devices, it’s possible for you to control lighting, heating and to a certain extent even small appliances within your home. Some home-owners like to turn their heating up or down via remote just before they get home so that they are welcomed into a comfortable home after work or a day out. A lot of people turn the lights on by remote just before they get home, so they don’t have the challenge of entering a pitch black eerie home. So home security offers a broad range of benefits for you and your family, they offer multiple services in one tiny device that can be installed into your home. One of our Certified Electricians in Milton Keynes are able to fit you the perfect home security suitable for you from CCTV to intruder alarms. We hope this article was informative and you use this new knowledge to keep your home and everything in it safe and sound!